Technological advancements across all the segments such as industrial, commercial and residential sectors and surge in the Information Technology industry disposed a vast business potential for the UPS systems in Thailand during the past few years. Additionally, growing investment in hospitality and healthcare sectors and government's efforts to strengthen the country's economy by investing heavily in manufacturing sector particularly for electronics and automobile would drive the market of UPS systems in forthcoming years. Central region captured the highest Thailand UPS market share on account of development of the commercial and industrial sectors owing to Thailand 4.0 development plan and other initiatives such as the Thailand Manufacturing Logistics Master Plan 2017-2020. The government is also aiming to increase the foreign investment in the coming years which would enhance the growth of the infrastructural footprint in the region. On account of several upcoming social infrastructure projects such as Magnolias Waterfront Residences Tower 1, Bangkok Mall and Grand Rama Tower market for UPS systems would increase during the forecast period. 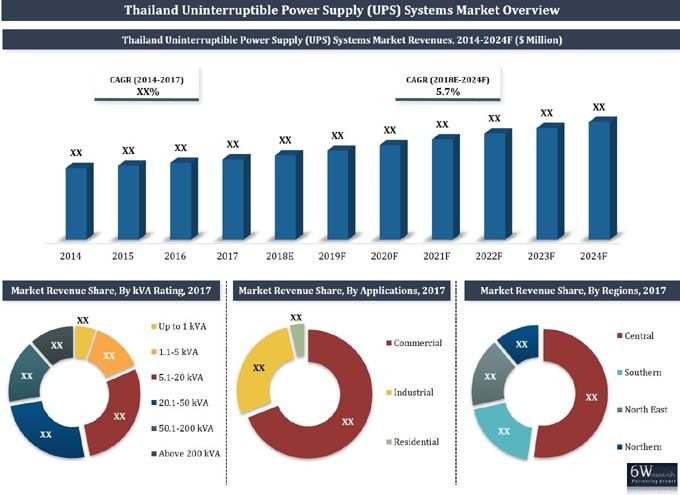 The Thailand UPS market report thoroughly covers the Uninterruptible Power Supply (UPS) Systems market by KVA ratings, applications and regions. The Thailand UPS market outlook report provides an unbiased and detailed analysis of the Thailand UPS market trends, opportunities/high growth areas, market drivers which would help the stakeholders to device and align their market strategies according to the current and future market dynamics. 13.5 RIELLO UPS SINGAPORE Pte Ltd.
13.6 Delta Electronics (Thailand) Public Co., Ltd.